Most historians of the Hundred Years War see the battle of Sluys, fought on June 24, 1340, as the first onslaught of this medieval conflict between France and England. A victory for the English, this naval battle allowed Edward III to land on the continent, to gather his Low Countries’ allies to him, and to besiege the town of Tournai, the nearest major French-controlled enclave. 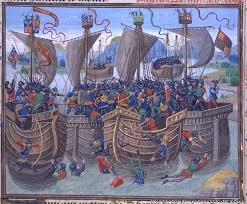 Fo the French, the battle of Sluys was also significant. Although militarily it was only a minor setback, the English siege of Tournai failing as it would, the French fleet had been destroyed and it would take a number of years before France could once again challenge the English for control of the Channel. What caused this English victory and French defeat? After a brief look at modern historical explanations of the causes for victory and defeat, this article will examine contemporary perceptions of what led to Sluy’s result. It will show that for Englsih, French and Low Countries’ authors, there are different reasons given for victory and defeat at Sluys. Finally, it will show how Jean Froissart, in three different redactions of his Chroniques, used all three “nationalistic” perceptions. This entry was posted in Articles and tagged 14C, Battle, battles, England, France, Late Medieval, Low Countries, Strategy. Bookmark the permalink.